I normally tweet whenever a language is reaches an important milestone but I was a bit absent from Tatoeba the past 4 weeks and I didn't really keep track of the progress of each language. So I'm going to sum up everything in this blog post and, while I'm at it, give more general stats about Tatoeba. English - 156,000+ sentences. English has taken the first place back in September and things still haven't changed. French - 50,000+ sentences. Around 10,000 sentences were added within 2 months. There's progress :) It had taken 3 months to go from 30,000 to 40,000. German - 27,000+ sentences. German lost its 4th position to Esperanto a few weeks ago. Chinese (Mandarin) - 14,000+ sentences. Turkish - almost 2000 sentences. Here's the number of new sentences we've had each month, since the beginning of the year. Sep 2010 - 49,148 sentences. 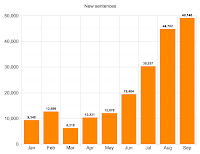 By the way, at the moment we have almost 550,000 sentences in total. We can safely expect to reach 600,000 sentences before 2011. But when will we reach 1 million...? Maybe some of you are curious to know how many people visit Tatoeba. 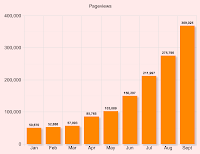 Here are some stats for each month since the beginning of the year (provided by Google Analytics). It would be nice, if you had similar images for the statistic of the Tatoeba sentences. You're right, I've added that too.